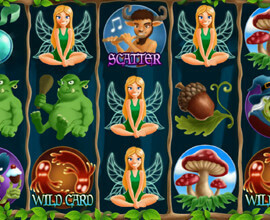 Go on a fairytale adventure in The Magical Forest video slot game. Don’t be scared, many of these mystical creatures can bring you great fortunes. 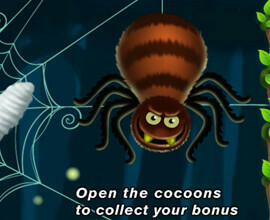 Get ready to take on the witches, ogres and other fairytale characters, and as expected, good triumphs over evil with the top paying symbol being the fairy, but don’t forget that spiders and ghouls can bring you fortunes too. 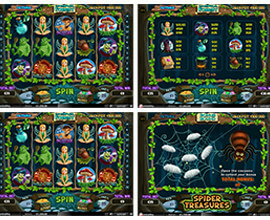 Keep your eyes open for 3 or more Spider bonuses to trigger the bonus round and remember that bonus rounds always pay, plus, all wins in the bonus round get multiplied by the line bet. Get 3 or more scatter symbols anywhere and you instantly win. 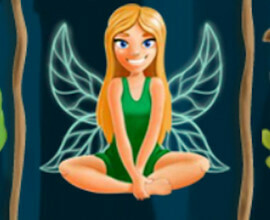 Three scatter symbols pays 3X your total bet, get four scatter symbols and receive 5X your total bet and if you are fortunate enough to receive 5 scatter symbols, then you will win 25X your total bet. The ghostly ghouls are wild, which means they can substitute for another symbol except scatters and bonus symbols, and if your combination has two wild cards, then the win is multiplied by 2, three wilds will multiply by 5 and four wilds will multiply the winning combination by 10. 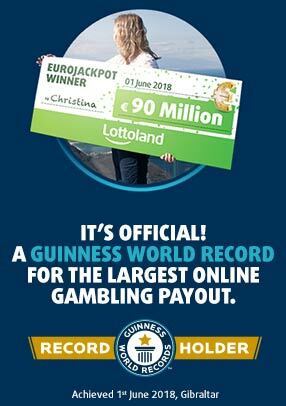 Using the ‘Auto Bet’ feature allows for the game to spin by itself based on the number of auto spins you select.